In the bowl of a kitchen mixer fitted with a whisk attachment, add the milk, egg, vanilla extract and ground vanilla beans. Turn the mixer on low and whisk well to incorporate. In a small mixing bowl add the flour, sugar, baking soda and salt, mix well. With the mixer on low, slowly add the flour mixture. Whisk on low until smooth. Slowly add the melted butter and mix until incorporated. Transfer the batter to a large mixing cup in order to easily transfer it to a squeeze bottle (my preference) or actual funnel. Line a baking sheet with paper towel and set aside. In a large saucepan add a good amount of oil, about 1/2-inch deep. Place over medium-high heat. When hot, squeeze the batter-filled squeeze bottle while moving it in a circular motion, creating a zig-zag, spherical shape. Cook until golden brown and slightly puffed, for about 2 minutes. 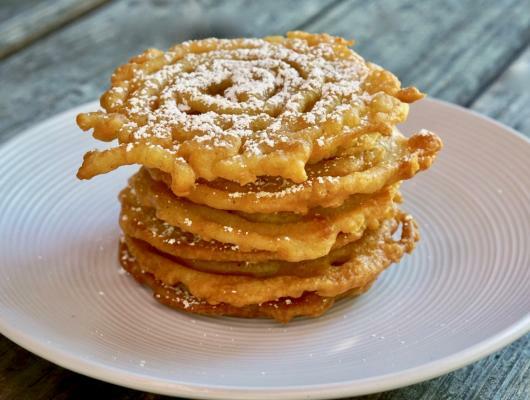 Using a metal spatula, carefully flip the funnel cake and cook an additional 1 minute. Remove the funnel cake from the pan and allow to drain on the prepared baking sheet. Repeat the above process with the remaining batter. 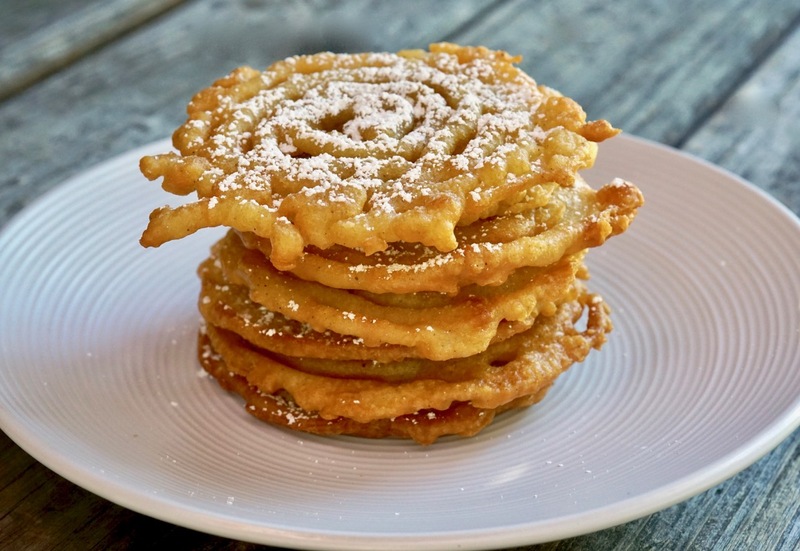 Dust the funnel cakes with powdered sugar and serve immediately.